In 1951, Walt Disney produced an animated version of Lewis Carroll's Alice's Adventures in Wonderland. Many of my generation grew up knowing this version of the story of a girl who fell in a rabbit hole and met a menagerie of creatures that could only exist in a child's dream. Half a century later Disney produces another film based on Carroll's enthralling tale, this time using the technology available to them. They also asked Tim Burton to direct it for a new generation of moviegoers. However, after watching the movie I got the feeling that people of MY generation who grew up with the animated film are in fact the target audience of this film. The film is set a good 13 years after Alice's original adventure. She's now 19 years old and she has the vaguest memory of her past after being convinced by his father that it was all a dream. She goes to a party, which unknown to her is her engagement party. When the stuffy young man proposes to her in front of the crowd, Alice runs away and followed the white rabbit which has been bugging her and motioning the time with his watch. She falls into the rabbit hole and her adventure begins as it was before. She had to eat the cake and drink the magic potion to get into Wonderland, which has been transformed into Burton's vision. In fact, some of the landscape in the film reminded me of The Nightmare Before Christmas. Burton made use of CGI effects to create a visually stunning world that is so full of details that I thought if I blinked, I'd miss some of it. I read Carroll's original story and its sequel, Through the Looking Glass before watching the movie thinking it would be re-interpreted by Burton. Instead, a new story was written by Linda Wolverton borrowing some elements and characters from the two books. Unfortunately, much of the wit and profoundness of the original story was watered down if not entirely lost, especially in the case of the Cheshire Cat. In fact the viewers cannot be blamed if they ask the same question some characters asked when they first met the adult Alice, "Is this the right Alice?" The new storyline turned Alice's adventure into a fantasy film in the mold of Dungeons and Dragons. It is now a journey of Alice's self actualization and The Mad Hatter's retrospection and self-redemption. It is also about women empowerment, with women deciding the fate of Underland. 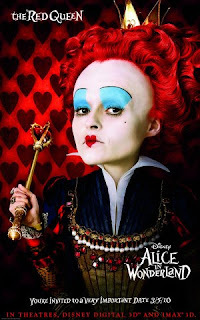 As for the performances, the film belongs to Helena Bonham Carter as the Red Queen. Although much of her body was transformed into CGI, they kept her face and voice so it was still her we see. Without even trying, she upstaged everybody else in this film. Most of the humor in the film came from her interpretation of the bratty, ill-tempered Red Queen. Watch out for her first scene and the one where she's doing a hat fitting. Johnny Depp is funny but disappointing at times. 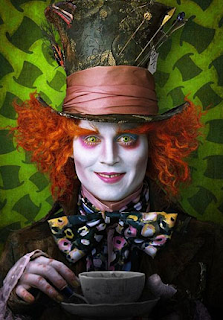 I was expecting him to make full use of his quirky acting as the Mad Hatter. His acting here looked like a cross between Jack Sparrow in Pirates of the Caribbean and Willy Wonka in Charlie and the Chocolate Factory. Not even his body twisting dance number moved the people in the audience. The character that confused me most was the White Queen played by Anne Hathaway. What was that all about? Why was she moving like a fairy traipsing in grass or worse, a drag queen? Maybe it was because of inhaling the fumes of all those potions she prepares when she moonlights as an apothecary. Poor Anne looked like an actress in a silent movie, she couldn't tell when to act serious or to go over the top. Some CGI characters though lost their original personalities. Alan Rickman's Blue Caterpillar sounded so much like Professor Snape snapping at Harry Potter and his friends. The poor Cheshire cat was reduced to a mere extra. The sleepy dormouse was completely changed and became a female martial artist. What saved the film is the use of current film making technologyThe movie took advantage of 3D technology to further enhance the CGI and make the viewing experience better. The scene where Alice was falling down the hole was so good that I felt like falling myself too. It was also used very effectively with flying rocking horse and the butterfly which dart in front of the audience in some scenes. So what is my final verdict? Go watch Alice in Wonderland for its GFI and great use of 3D technology. It is a visual psychedelic ride. However, this isn't the Alice in Wonderland we grew up with although we could be its target audience as well as those familiar with Carroll's tale. This a new take on the same story but this tale has been told before and in a more effective and delightful way.